Dr. Kenneth W. Coffey of Orland Park offers patients the finest in restorative dentistry to improve dental health and cosmetic dentistry to enhance the look of the smile. Yet general dental care and preventative dentistry are keys to lasting wellness, which is why appliances like mouth guards are so important. 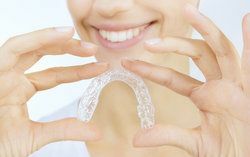 Mouth guards are protective retainers that are worn in order to protect the teeth, the gums, and the tongue from harm. With a mouth guard in place, serious injury to the mouth is less likely, which prevents the need for serious restorative or reconstructive dental work. Let's look at some good candidates for mouth guards. If you are an athlete who plays contact sports or participates in combat sports, mouth guards are an ideal thing to have. By wearing a mouth guard, you are wearing protective gear that will prevent injury and help you have a healthy and beautiful smile for years to come. If you are an athlete, it can make a major difference if you get a custom mouth guard rather than a stock mouth guard. Stock mouth guards may be too uncomfortable for you, leading to distractions despite the benefits of protection. A custom mouth guard, on the other hand, will fit comfortably and can potentially give you the confidence and edge that you need to take your game to the next level. It's worth considering, so be sure to discuss these matters with our team when you get a chance. Teeth grinding refers to the clenching, gnashing, and shifting of the teeth while a person is asleep. This may be the result of excessive stress, poor dental alignment, or a combination of both. Left untreated, teeth grinding can lead to damaged teeth, gum recession, and other serious health issues. One of the keys to good teeth grinding treatment is the use of a mouth guard, specifically a night guard. This is a mouthpiece that is worn during sleep, preventing the teeth from direct contact and protecting them from harm in the process. This protects the teeth and reduces the stress on various structures of the mouth. The temporomandibular joint (TMJ) is located where the mandible meets the skull and is one of the most complicated joints in the human body. This makes sense given all the motions that have to be made to bite, chew, speak, and make facial expressions. When the jaw does not function properly, it can lead to popping, locking, grinding, and pain. One of the common causes of TMJ disorders is teeth grinding (bruxism), which is why the use of a night guard is often part of the treatment process. The night guard will help reduce the stress placed on the jaw joint, and in the process reduce the severity of the symptoms of the condition. For more information about sports dentistry, teeth grinding, TMJ disorders, and other matters related to advanced dental wellness, it's important that you contact our cosmetic and restorative dentistry center today. Dr. Coffey and the team at the practice look forward to your visit and helping you achieve excellent dental health.